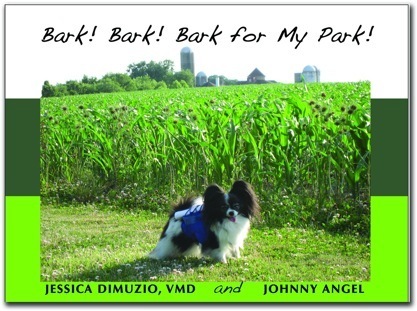 JUST RELEASED: Told from the viewpoint of a five-pound Papillon dog, Bark! Bark! Bark for My Park! recounts the struggle to save a 690-farm park from destruction. The story proves that no matter what size, age (or even species) you are, you have the power to make a difference. Bark! Bark! Bark for My Park! engages readers through its unique, lively design and vibrant photographs by nature photographer Timothy Wood. Appropriate for early elementary school readers, the story resonates with dog lovers, conservationists, and kids of all ages. JUST RELEASED: Told from the viewpoint of a five-pound Papillon dog, Bark! Bark! Bark for My Park! recounts the struggle to save a 690-farm park from destruction. The story proves that no matter what size, age (or even species) you are, you have the power to make a difference. Bark! Bark! Bark for My Park! engages readers through its unique, lively design and vibrant photographs by nature photographer Timothy Wood. Appropriate for early elementary school readers, the story resonates with dog lovers, conservationists, and kids of all ages. Winner of the Society of Children’s Book Writers & Illustrators (SCBWI) International Kimberly Colen Memorial Grant Award!